Home Table What is Pillar Type Drilling Machine? What is Pillar Type Drilling Machine? 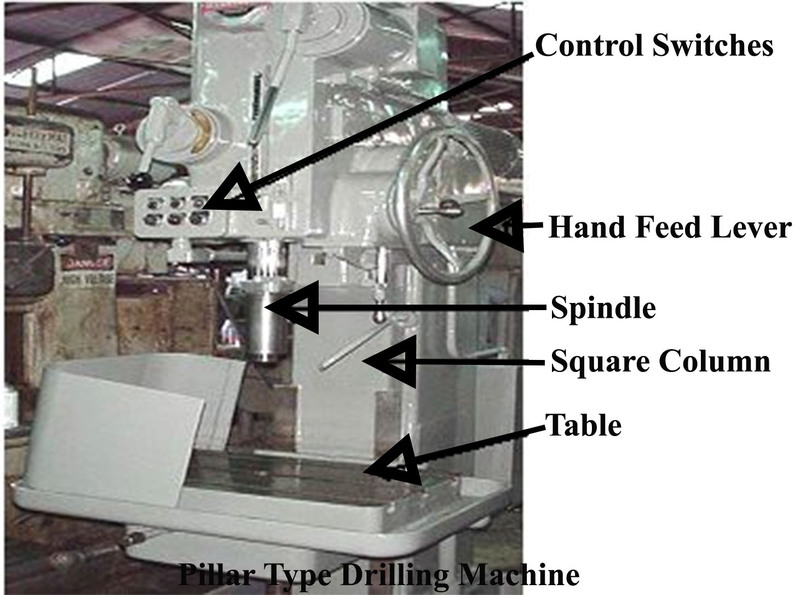 Pillar type drilling machine can be round or square column. The column can be raised from the base which rests on the floor. It has an arm, round table and drill head assembly. The arm and table has three adjustments for locating the work piece under spindle. Arm and table can be moved up and down to accommodate work pieces of different heights. It can be moved in an arc up to 1800 around the column and can be clamped at any position. This permits the work to be supported on the base of the machine and the arm can be swung out of the way for drilling heavy and odd size work pieces. Lastly, the table can be rotated 360O about its own centre to locate the work under the spindle. The construction of the machine being not very rigid and the table being supported on a horizontal arm, this is particularly intended for lighter work. The maximum size of drill which can be used is 50 mm. In box or square column type, the table is of square type and is fitted on the slides at the front face of the machine column. Heavy box column gives the machine strength and rigidity. The table can be raised or lowered by an elevating screw that gives additional support to the table. This type of machine is designed to drill more than 50mm diameter holes on heavier work pieces. (a) Base. It is that part of the drilling machine on which vertical column is mounted. In case the machine is belt driven the base is attached with cone pulley. Top of the base is provided with ‘T’ slots to hold work holding devices and large work piece. (b) Column. It is the vertical member of the drilling machine which supports the table, and contains driving mechanism. The box type column is more rigid. In some of the round column machines rack teeth are cut on the face for vertical movement of the arm and table. The vertical movement is effected by rotating the table-elevating handle, which causes a pinion mounted within the arm to rotate on the rack teeth. 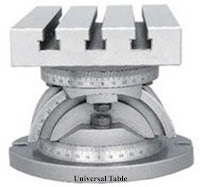 In box column type the front of the column is accurately machined to form guide ways on which table can be moved up or down for vertical adjustment. (c) Table. It is mounted on the column and is provided with “T” slots for clamping the work or tightening various work holding devices. It may be round or rectangular in shape. It may be fixed or universal type. 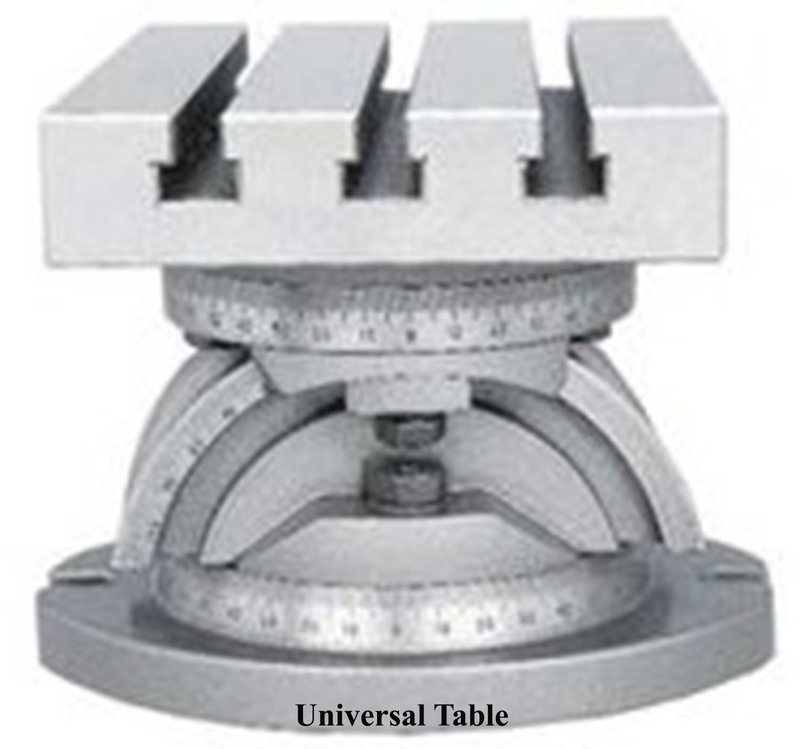 Universal type of table can be tilted at an angle to facilitate the work to be carried out at required angle. (d) Head. The drill head is mounted on the top of the column and houses the driving and feeding mechanism of the spindle. In some machines the drill head can be adjusted up and down for different length of work pieces. In lighter machines the motor is mounted at the rear end of the head for counter balancing the weight of the drilling machine spindle. (e) Spindle. It is a vertical shaft which holds drills and drill chucks. It gets motion from the top shaft through the bevel gears. A long key way is cut on the spindle and a sliding key connects to the bevel gear. This mechanism allows the spindle to get positive drive at different spindle positions while the drill is fed in to the work. The spindle rotates with a rotating sleeve which is known as quill. Rack teeth are cut on outer surface of the sleeve. The sleeve may be moved up and down by a pinion. Pinion is connected to a lever. The lower end of the spindle is provided with morse taper hole for accommodating taper shank drills and drill chucks. A slot is provided at the end of the taper hole for holding the tang of a drill to impart the positive drive. A drift may be pushed through the slot for removing the drill. For holding smaller size drills a drill chuck is held as the taper hole of the spindle. (i) Step Cone Pulley Drive. The motion is transmitted from overhead line shaft to the counter shaft mounted on the base of the machine. The counter shaft may be started and stopped by shifting the belt from tight pulley to loose pulley. The speed of the drilling machine can be changed by shifting the belt from one step to another on cone pulley. The number of speeds depends upon the number of steps on the cone pulley. (ii) Step Cone Pulley with Back Gears. This is another type of spindle drive mechanism similar to step cone pulley drive. In order to obtain larger number of spindle speeds the back gears are incorporated in addition to cone pulley. (iii) Spindle Drive by Gearing. Modern heavy duty drilling machines are driven by individual motor mounted on the frame of the machine. The multiple speeds may be obtained by sliding gears or sliding clutch mechanism or by combination of the two.